Howard, Ross and Henry Regier. "Pollution". The Canadian Encyclopedia, 16 December 2013, Historica Canada. https://www.thecanadianencyclopedia.ca/en/article/pollution. Accessed 25 April 2019. Pollution can be defined as the release of any material, energy or organism that may cause immediate or long-term harmful effects to the natural ENVIRONMENT. Pollution was viewed initially as the unsightly mess or visible environmental damage resulting from careless disposal of various materials. Most commonly, pollution was seen as the dirty scum on rivers or lakes, the grey and yellow smog in the skies over cities or the fumes in foundries and factories. These obvious problems were considered local concerns which would be diminished by burial or by using natural air and water currents to distribute the wastes over greater areas in which the environment would absorb and purify materials. Dilution was considered a solution. But the pollutants caused harm to other users of the environment so that polluters were forced to reduce emissions from sewer pipes, smokestacks and industrial processes and products generally. By the 1990s free use of the environment for waste disposal was generally considered to be unfair to other humans and to the environment itself. Pollution can take the form of excessive NOISE, causing damage to hearing; heat discharged as hot water from power plants, changing the aquatic species association; high intensity radiation from the disintegration of radioactive substances, damaging human genes; and pathogenic organisms, causing disease. Scientists are still unsure how much exposure to many modern pollutants is dangerous to humans and other living things. In some cases, no exposure may be the only safe exposure, leading to the slogans &QUOT;zero discharge&QUOT; and &QUOT;virtual elimination&QUOT; of hazardous contaminants. Scientific research increasingly has shown that pollution includes odourless and colourless chemicals that remain active in soil, air and water long after the materials they were used in have disappeared. Pollution now also includes chemicals that were gradually sprayed on farmland as fertilizers and PESTICIDES, others from inside pressurized spray cans, and others plastered on walls and ceilings as ASBESTOS fireproofing. Problems can take decades to develop, as with the fatal lung disease asbestosis, caused by exposure to asbestos dust. Problems are now known to be widespread. ACID RAIN that kills fish in Ontario lakes comes largely from AIR POLLUTION emitted by smokestacks hundreds of kilometres away in southern Ontario, Ohio and elsewhere. Snow falling in the Canadian Arctic includes chemicals from Japan. Cold Lake SUPERIOR receives agricultural pesticides transported atmospherically, apparently from Mexico; when the lake's water warms, some of these contaminants escape back into the air and are transported into Arctic ECOSYSTEMS where they accumulate. Pollution increases in part because of Earth's rapidly expanding human population. Each human necessarily produces some wastes. But people in cultures that enjoy a high material standard of living, and who use technology that is wasteful and polluting, have a much greater harmful effect than people of more modest and caring cultures. Growth of all 3 factors - population, material consumption and technological wastefulness - must be limited and eventually reversed, if the struggle against pollution is to be won. Meanwhile a series of natural features will be lost forever. 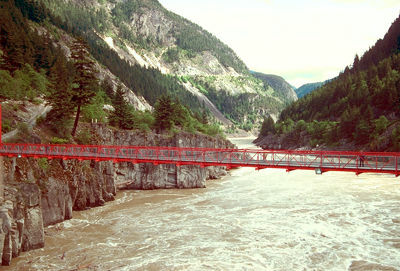 A city also utilizes additional area for producing resources and assimilating wastes, which may be called its &QUOT;ecological footprint.&QUOT; In British Columbia, the Lower Fraser Valley has been calculated to have an ecological footprint that is 19 times as great as the area of the region itself. If more of the region's wastes were used as resources, the size of this ecological footprint would not expand as rapidly as it would do otherwise. In the 1950s, to meet the growing demands of our wasteful consumer society, many new and unnatural chemicals were developed for use in the production and manufacture of food and drugs, etc. Many synthetic chemicals do not decompose through natural biological processes (eg, the action of sunlight, heat and cold or BACTERIA). These chemicals leak into the environment, and accumulate in land, air, water, vegetation and our bodies. Some organic chemicals that contain chlorine are chemically attracted to fat deposits in organisms. Such chemicals are transmitted through the ecological food chain from plants to animals and become progressively more concentrated because organisms have evolved no efficient processes to break down or expel such chemicals. As their concentration increases up the food chain they become more toxic, especially for the earliest life stages. The pesticide DDT provided an early example of the danger of bioaccumulation. Millions of kilograms of DDT were used to kill insects in North America, until scientists discovered that the chemical was accumulating in birds that eat insects and fish. The pesticide accumulated to the point of damaging the eggs of birds; thus, for example, the PEREGRINE FALCON came close to extinction. DDT was banned in Canada by 1971, except that its use for some crops, such as tobacco, was permitted for some additional years. Twenty-five years after the partial ban, DDT concentrations in gulls, lake trout and eagles in the Great Lakes have fallen dramatically. Some species such as gulls have rebounded excessively, in part because the ecosystem is still severely unbalanced. Pollution is now analysed and evaluated medically for its potential to cause CANCER or developmental disabilities, its longevity (often many years) and its concentrations (usually minuscule). Many chemicals that Canadians have accepted, tasted, worked with and relied on since the 1950s are now known to be &QUOT;toxic&QUOT; or deadly in low doses over long periods of time. Polychlorinated biphenyls (PCBs) were hailed as a technical marvel some decades ago with many industrial uses and practically no harmful side-effects. Many years later chemists found a way to identify and measure them in low concentrations in the environment and in organisms, and they are now indicted as a hazardous substance. Until the 1990s medical scientists tended to presuppose that cancer was generally the largest risk with hazardous contaminants. This assessment followed from an assumption that damage to genes leading to cancer was the main cause of harm to humans. Some contaminants, such as radionuclides (a radioactive atom), are genotoxic (affecting genes), but others are mostly neurotoxic (affecting nerves or disrupting the endocrine system by mimicking or blocking hormones). The process of reproductive development that involves the egg, sperm and then the embryo also involves the intricate sequential emergence of all 3 subsystems of &QUOT;information&QUOT;: genetic, neural and endocrine. Hazardous contaminants interfere with these information systems, in a way analogous to insidious viruses in a computer. A human being or any organism that results from the working of an impaired or subverted informational system may be permanently handicapped in one or more ways. The kind of science particularly appropriate for studying such &QUOT;disinformational&QUOT; phenomena has itself been evolving. There is controversy about what kinds of new science are reliable and about the early findings of a new science. The weight of evidence is that hazardous contaminants now distributed throughout all the ecological and human systems of the world are causing much harm to complex developmental phenomena. We currently understand enough to judge that precautionary measures must be taken before full proof is available. Over the years, a number of incidents have illustrated the potential seriousness of pollution problems. In northern Ontario, many residents along the English-Wabigoon river system lost their jobs as commercial fishermen, and their community its stability, because of invisible, poisonous MERCURY in the fish (seeGRASSY NARROWS). The mercury was released by a local paper mill before 1970, and remained a danger in the water and fish for many years. At Port Hope, Ont, thousands of tonnes of slightly radioactive wastes, dumped years earlier, were removed from beneath houses, schools and stores to lessen the danger of cancer developing among citizens. In Toronto, public clinics were held to test the blood of residents of some neighbourhoods for low levels of LEAD, which could lead to nervous disorders and learning disabilities; lead escaped from factories, some of which were recycling car batteries rather carelessly. Many industries long ignored the obvious pollution they were creating. Some entrepreneurs have - or once had - a business ethic that requires them to maximize profits for shareholders, and any activities, such as pollution of indoor and outdoor environments, are taken to be permissible except where they are expressly forbidden by law. As the SCIENCE COUNCIL OF CANADA pointed out in its scathing 1977 report &QUOT;Policies and Poisons,&QUOT; governments were for too long ill-equipped to measure pollution and too hampered by red tape and political compromise to tackle polluters. Governments have become much more proactive, but some pollution problems will not be resolved until well into the 21st century. Public opinion surveys show that environmentalism and pollution-fighting are now consistently important concerns of Canadians. The response to pollution is no longer perceived as a simple decision to shut down a polluting factory and suffer the economic consequences. Increasingly, jobs are created by cleaning up and protecting the environment. Waste materials are recycled instead of dumped, thus saving companies money. The cost of clean and green technology and pollution prevention is less than that of repairing environmental and health damage, or losing an environmental resource forever. If the polluter must eventually pay, then it makes good sense economically to internalize the costs. By the end of the 20th century in Canada, only some obsolete, criminal or derelict entreprises still fight this policy in order to eke out the last bit of ill-gotten profit. Some companies have found that a switch to clean and green technology has led to greater profits. Science and citizens are working in 2 directions: studying new and existing chemicals, using toxicological, epidemiological and ecosystemic approaches, for subtle but long-lasting consequences for living things; and devising new laws and codes of practice to ensure proper cleanup of existing problems, prevention of new ones and the exercise of personal safety precautions with respect to contaminants everywhere (see ENVIRONMENTAL LAW). Polluted water can destroy valuable commercial and sports FISHERIES, make vital supplies of drinking water unfit for human and animal consumption and damage a recreational and aesthetic resource of immeasurable value to all Canadians (see WATER POLLUTION; and WATER TREATMENT). Sewage treatment can be done at a number of levels, from primary treatment, in which only the solid materials in the sewage mixture are removed and disinfectants are added to kill pathogenic organisms, to advanced tertiary treatment, in which the effluent from the treatment plant may be of better quality than the natural waters into which it is released. In Canada in the late 1990s the level of treatment of sewage may be related to the magnitude of the natural currents of the receiving waters and the degree of isolation of the city from downstream cities. In the GREAT LAKES, advanced tertiary treatment was agreed to under a 1978 binational agreement; all large treatment plants met this requirement in the 1980s and most small treatment plants do so in the 1990s. In the case of Montréal, the large flow of the St Lawrence River was relied on to dilute and assimilate the wastes until the 1990s. In Victoria, BC, and Halifax, NS, in the late 1990s, most of the sewage flushes untreated into the ocean where it is dispersed by tidal and longshore currents. Halifax has been planning since the 1970s to do something about the mess that sewage created in its harbour. 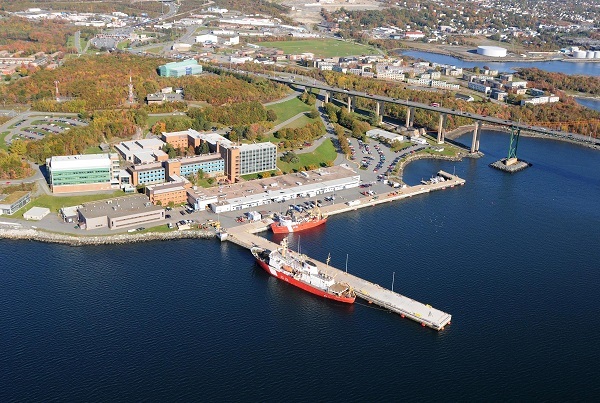 A plan produced in the late 1980s would provide primary treatment and disinfection for about 75% of the raw sewage and stormwaters currently discharged into the harbour. This plan was still not funded in the late 1990s. In the 1960s, Lake ERIE was transformed ecologically and took on some features of a vast sewage lagoon. Because much rotting or decomposition occurred with release of foul smells, the lake's condition was described as a version of ecosystemic &QUOT;death.&QUOT; Complex pollutants such as dissolved metal ions (eg, mercury and cadmium), organochlorine chemicals (eg, DDT and PCBs) and phosphates (from household detergents and agricultural fertilizers) interacted with excessive fishing and improper shoreline restructuring and dredging to cause the transformation. Shallow bays in all the other Great Lakes also exhibited ecosystemic transformations similar to that in Lake Erie. Following decades of remediative and rehabilitative reforms, costing billions of dollars, some of these transformations are coming to be reversed, in part. They will never return to a state closely resembling pristine nature. In 1981 Canadian scientists discovered, for the first time, tiny amounts of one of the most deadly manufactured chemicals, DIOXIN 2, 3, 7, 8-TCDD, in the Great Lakes. Dioxin is a by-product of industrial processes involving chlorine and organic materials. The chemicals for this herbicide were made in Niagara Falls, NY, and Elmira, Ont; both locales will continue to suffer consequences of dioxin contamination for many years. Expensive barriers to stop leaks from chemical dumps, and efforts to excavate and destroy contaminants in soils, reduce the level of risk but cannot eliminate it entirely, because these methods are so costly that they are used very sparingly. Industrial and urban waste dumping, poor agricultural practices and mineral exploitation all produce pollutants that reduce or destroy the ability of soil to sustain healthy plant life. Many of these pollutants are ultimately transferred to water bodies, but en route they can sterilize, poison and erode the soil (seeSOLID WASTES; and WASTE DISPOSAL). There have been some advances to reduce the effects of waste disposal. Incineration of garbage can produce some useful energy, particularly in cement kilns, and substantially reduce the volume to be buried, but adds its own risks of air pollution. Chloride ions can be split from hazardous organochlorine substances such as PCBs through chemical reduction to produce harmless salt and useful organic fuels. RECYCLING and source reduction - for example - of unnecessary packaging, are becoming important industries and household garbage is becoming a valued resource. In some automobile industries the metals and plastics are chosen so as to facilitate disassembly and recycling when the automobile is worn out. Other sources of land pollution include poor AGRICULTURAL SOIL PRACTICES and logging, which expose the bare topsoil to wind and water EROSION, or excessive use of chemical fertilizers and pesticides, which gradually accumulate in soil and reduce crop growth or make crops unsafe for human consumption. Polluted soil which lacks vital minerals and micro-organisms to hold it together is also more subject to erosion. Erosion can lead to enormous accumulations of silt in rivers and streams, blocking the flow of water and predisposing them to flooding and severe bank erosion, as a kind of positive feedback process. There are no fully safe sites for burying highly toxic industrial wastes (see HAZARDOUS WASTES). Three or 4 decades after nuclear wastes were first generated in nuclear electric generating plants, no safe way of storing or disposing of such wastes has been found (see NUCLEAR ENERGY). Parts of the large generating facilities themselves have become radioactive, and what will become of them is currently unknown. Air includes a wide range of substances produced by natural and man-made sources; most of these substances have not accumulated to obviously harmful levels. The major source of these pollutants is the burning of carbon-based fuels including coal, oil and natural gas, which produces invisible potential pollutants. These can cause local, regional and worldwide pollution problems, either as individual chemicals or in combination. Smog, for example, is a combination of nitrogen oxides, hydrocarbons and carbon monoxide, which, under the action of sunlight and water, are blended together into pollutants: particulates and ozone, which irritate human lung tissue and damage vegetation; aldehydes, which irritate human eyes and skin; and acids, which damage human tissue and buildings. A week-long smog in London, England, in 1952 caused more than 4000 deaths and prompted enactment of new limits on the burning of coal in city factories and homes. In Toronto the human death rate increases by several percentage points on smoggy days. In Canada, particulate or gritty air pollution has been reduced by installation of filters on smokestacks, by redesigned industrial processes and by better-tuned automobiles. In southern Ontario, locally generated smog is supplemented by smog from the American Midwest which is transported northeastward by low pressure atmospheric systems. When local weather conditions allow smog to accumulate, local industry is required to reduce operations until weather improves, ie, until the local smog is diluted and displaced by fresh winds. Overall, the pollution outlook for Canadians for the next 20 years is murky. Locales such as Sudbury, Hamilton, Toronto and Montréal are now less polluted than they were some decades ago. This is also the case with the whole Great Lakes-St Lawrence River basin. But pollution that is transported by global processes, such as carbon dioxide that causes GLOBAL WARMING and chlorofluorocarbons (CFCs) that cause OZONE DEPLETION, is increasing. Serious pollution may be here to stay, at least for another century. None of our grandchildren or their grandchildren will be spared all of the bad consequences of our pollution. Donald Chant, ed, Pollution Probe (1970); Theo Colborn, Dianne Dumanoski and John Peterson Myers, Our Stolen Future: Are We Threatening Our Fertility, Intelligence and Survival? - A Scientific Detective Story (1996); Environment Canada and United States Environmental Protection Agency, State of the Great Lakes (1995); Environment Canada, The State of the Environment in Canada (1996); Bill Freedman, Environmental Ecology: The Ecological Effects of Pollution, Disturbance, and Other Stresses (1995); Ross Howard, Poisons in Public: Case Studies of Environmental Pollution in Canada (1980); Anthony J. McMichael, Planetary Overload: Global Environmental Change and Health of the Human Species (1993); Robert Paehlke, ed, Conservation and Environmentalism, an Encyclopedia (1995); Mathis Wackernagel and William Rees, Our Ecological Footprint: Reducing Human Impact on the Earth (1996). Glossary: Environment and Sustainable DevelopmentAn extensive glossary of terms related to environmental and sustainable development issues. Kelleher EnvironmentalThe website for Kelleher Environmental, an environmental consulting company specializing in solid waste management, waste diversion, climate change, green energy, energy conservation, and related sustainability issues.